Sitting with Jude Mansilla in the CanJam room at the 2015 Rocky Mountain Audio Fest he told me, "When I started the Head-Fi site I imagined it a 'gateway drug' to two-channel room-based audio." Judging by the attendance and activity in the CanJam area, headphones have become more than a gateway - for many young and old audiophiles they're a final destination. That is Steven Stone writing in the The Absolute Sound. For an audience ranging from young to old the immersive experience of headphone sound has become a destination, yet classical music remains fixated on a different destination - the 19th century convention of the proscenium arch soundstage. In an insightful essay in The New Enquiry Elizabeth Newton posed the question: "Audio fidelity is more a matter of subjective emotion than empiricism. But what are we trying to be true to?" Her question generated considerable discussion on the audiophile website AudioStream, with one protagonist opining that "My idea of hi-fi is to make the possibility of losing oneself in the music happen as often as I choose...". 21st century composers are in a unique situation, with an inexhaustible range of technical resources, highly refined musical languages, the aesthetic perspective gained from the cutting edge of the twentieth century, and technological developments that multiply exponentially the ways listeners can access music... Written music, except for certain kinds of religious music, has always been composed to be played on a stage in front of the audience. Since the first multi-channel recordings were made, almost all producers and sound engineers have been faithful to this “frontal” approach to music, using surround channels only for picking up the room’s reverberation. 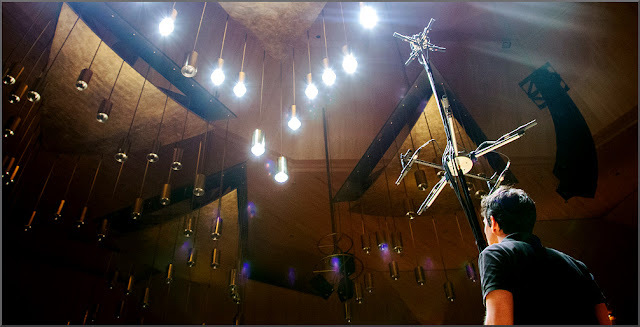 However, listening to a surround recording is not like attending a concert; instead, it means placing yourself at the centre of the sound experience, while contemporary music does not need to comply with the spatial concepts of the classical concert. Playback equipment is a tool permitting the creation and reproduction of acoustic spaces, and allows us, in cooperation with composers, to design tridimensional sound spaces. Neu Records are pursuing their belief that contemporary music does not need to comply with the spatial concepts of the classical concert, and among their work in progress is a Morton Feldman series with sound described as "almost spaceless" - the header photo shows the 360° microphone array used in their sessions. Past posts On An Overgrown Path have featured Neu Records' surround recording of Ramon Humet's music made with the London Sinfonietta and discussed the philosophy behind the immersive sound, while another post highlighted their first release of the music of the Catalan composer Bernat Vivancos (b. 1973). 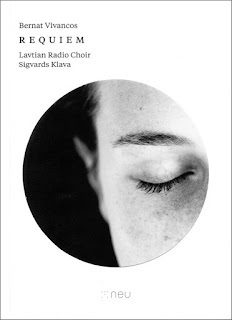 Now comes the premiere recording of Bernat Vivancos' Requiem made with the Latvian Radio Choir conducted by Sigvards Kļava. Although Vivancos trained at the celebrated Escolania de Montserrat which is one of the oldest choral schools in the world, his Requiem does not adhere to the liturgy of the Catholic Mass. Instead, to quote the composer: "The idea is that this prayer should be new, without linking it to any previously established canon. It is intended to be a luminous meditation on transcendence, in which a selection of open, plural texts and reflections responds to a non-confessional vision of the end of human existence". Accordingly the sources for the syncretic text include Pierre Teilhard de Chardin, Denis Diderot, Pope Francis, Kahil Gibran, the New Testament, and Bahá'u'lláh, founder of the Bahai faith. Bernat Vivancos' Requiem was supplied as a requested review sample. Any copyrighted material is included as "fair use" for critical analysis only, and will be removed at the request of copyright owner(s). Also on Facebook and Twitter. Vivancos is such a breath of fresh air. Thank you for this glorious music, and thank you Neu Records for this beautiful recording. Bob Shingleton's reviews are always erudite and inspiring. We at Yarlung Records have just begun surround sound recordings--working with engineer Tom Caulfield who comes to our California sessions from Boston. So far so good! Our first 5-channel releases are scheduled for 2016. I have been a two-channel purist since before Yarlung began, but am happy to investigate other formats to deliver musical experiences for our listeners. So happy that Neu Records is leading the way.